Leader of Students for a Free Tibet is detained and ousted from Beijing after protest. Kurt Langer says he was followed by undercover police officers for more than a day, then arrested by Chinese authorities and interrogated before he was deported to the United States. The Boston native and board chairman of Students for a Free Tibet arrived in Boston last night and outlined the frightening ordeal he endured after protesting at the Olympic Games in Beijing to raise awareness for Tibet. Langer, 34, and five other demonstrators from his group were arrested and forced out of China on Friday [15 August 2008] after hanging a 375-square-foot "Free Tibet" sign from the façade of the headquarters of state-run China Central Television. The organization also protested at the Birds Nest Stadium, in Tiananmen Square, and at the Chinese Ethnic Culture Park. "It was a little disconcerting," Langer said of his arrest. "I was detained in Beijing for nine hours." Langer, who now lives in New York City, developed an interest in Tibet during a semester abroad while a student at Brown University, where he founded a chapter of Students for a Free Tibet. "The more of the personal stories I heard, the more I wanted to do to raise awareness," he said." I always knew it [getting arrested & deported] was going to be a possibility." 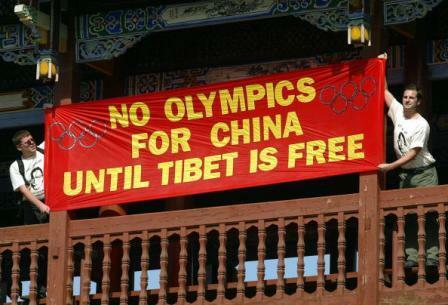 In an interview with ABC News Friday [15 August 2008], the vice president of the Beijing Olympic Organizing Committee, Wang Wei, called the protest at CCTV "a very unwelcome and unacceptable kind of activity in China" and said that conditions in Tibet were good. While in Beijing, Langer had been acting as a spokesman for Students for a Free Tibet. Last night, about 30 Tibetan-Americans met him at Logan International Airport. "I didn't know [supporters would be here]," Langer said. I felt very honored." When Langer arrived, the group presented him with a white ceremonial scarf, draped a Tibetan flag over his shoulders, and gave him a bouquet of purple and white flowers. Ngawang Jordan, a 30-year-old volunteer for Students for a Free Tibet, organized the group of greeters, most of whom said they had never met Langer. Jordan was born in India to Tibetan parents and moved to Boston in 1999, "for a better life," he said. "We really felt touched by it," Jordan said. "He's a non-Tibetan supporter, and he's really working for the Tibetan cause." The Tibetan community in Boston, Jordan said, was grateful that Langer had taken a stand for Tibet; most Tibetan-Americans cannot get visas to return to China simply because of their names, Jordan said. Chodon Tenzin, 49, of Boston, was among the local Tibetan-Americans who gathered at the airport to greet Langer. She said she wanted to go to Beijing for the Olympics, but was denied a visa. "Something like this, I can do," she said. "We have a responsibility to do something, to show the world, that Tibet needs to be free." As the Games approached, protests about alleged rights abuses in Tibet escalated. The Tibetan-American community and Students for a Free Tibet maintain Tibetans are not free under Chinese rule. "We really appreciate his support and the risk and trouble he took," said Pema Tsewang, 52, a Boston resident who works for a company publishing books about Tibetan Buddhism. "He was able to show the spotlight about what is going on in Tibet right now and how the Tibetans are suffering." "No matter what it takes, Tibet will be free," Tenzin said.